September's selected bread recipe at Rose's Bread Bible Bakers, is Basic Hearth Bread. Rose's Bread Bible Bakers is a group of bloggers who are currently baking from Rose Levy Beranbaum's book, The Bread Bible. This is a rustic bread with golden crust containing only bread flour, some whole wheat flour, water, yeast, salt and small amount of honey. This bread starts with the sponge starter which is left to ferment for 1 to 4 hours. The dough is very easy to work with, it is just slightly sticky. With a light dusting of flour on your hands, it is easily handled without any fuss. One thing to note is to plan in advance, and start making this bread in the morning if you want to enjoy it for dinner, as it takes 3 risings, and needs some time to cool off before slicing. It can be shaped either as a free-form round loaf, or shaped into a rectangular and baked in a loaf pan. I chose to make mine as a free-form round loaf. When the dough has done it's final proofing, the top is slashed with several 1/2-inch deep slashes. This is one area where I need more practise! The first pic above, is taken when the risen dough is placed in the preheated oven at 475F. 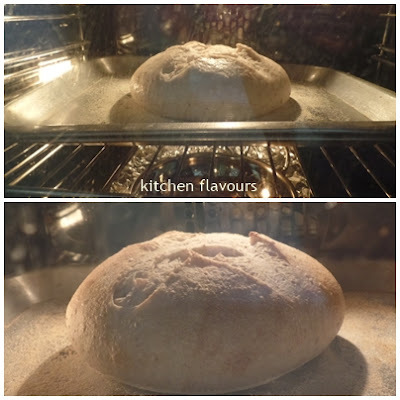 The second pic is taken 10 minutes later, when the temperature of the oven is reduced to 425F for the rest of the baking time. It has very nice oven spring during the first 10 minutes! Makes me smile just looking at it! I was planning to have this bread for dinner, with some stew, but could not make it on time. But we did enjoy it the next day for brunch instead. Made into garlic bread, dipped in mushroom soup. Mix some softened salted butter, garlic powder and chopped chives. I love using garlic powder to make garlic toast. Spread a generous amount on each slice of bread, cut horizontally to get two long pieces, and toast in the oven until golden and crispy. Toasted garlic bread, crispy and smells garlicky nice. Serve with mushroom soup. Yums! Makes a very good brunch! Up next in October, we will be baking Irish Soda Bread, page 148. Beautiful! It would make a great sandwich too. Joy your bread turned out wonderful! A beautiful loaf of bread and the garlic bread looks so delicious!